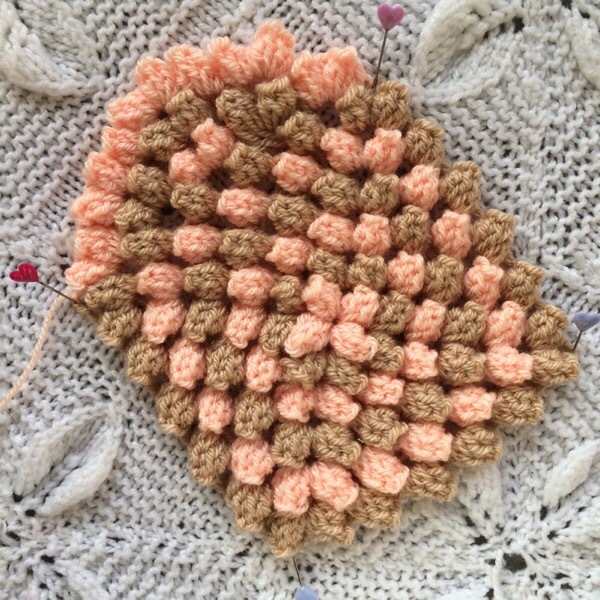 I’m not really a lovey dovey, cutesy kind of person but I do seem to be drawn to crochet hearts so I’ve had a go at coming up with another crochet heart pattern. I hope you like – let me know what you think. Here goes…. Notes The tutorial is in UK terms and I used Stylecraft Special DK with a 4.5mm hook. 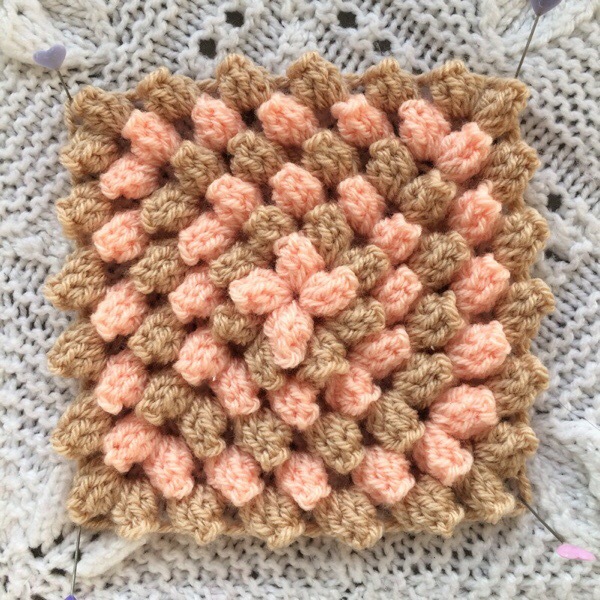 PC = Popcorn made from 5 treble crochet. 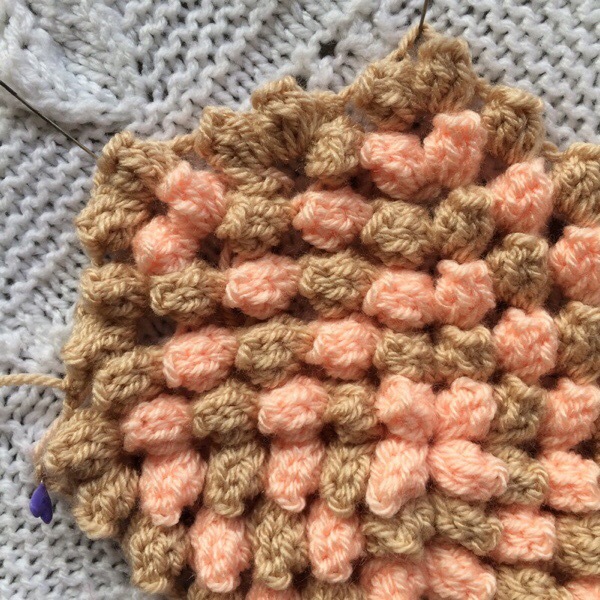 For the purposes of the tutorial photos I’ve alternated colours on each round in order to help you see where the popcorns are made, but the pattern is written for use of 1 colour only. If you use alternating colours fasten off your yarn at the end of each round and join the new colour in the next corner space. How to make a popcorn – Make 5 tr into the stitch or space that you are working in to. – Remove the hook from the loop. 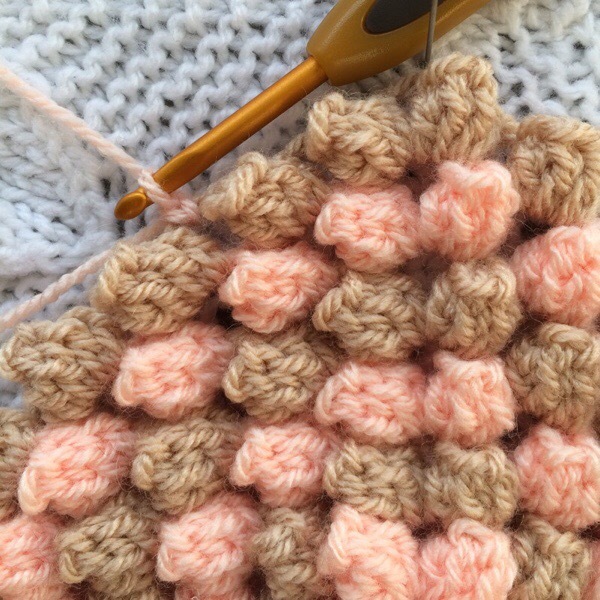 – Working from front to back, put the hook under both loops of the first tr crochet in the group. – Pick up the dropped loop and bring it back through this first stitch. 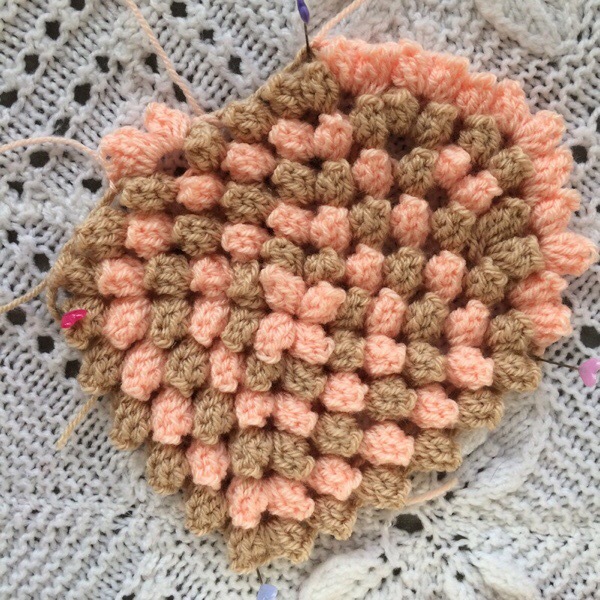 Note: The basis of the heart is effectively a 6 round granny square, only made with popcorn stitches. 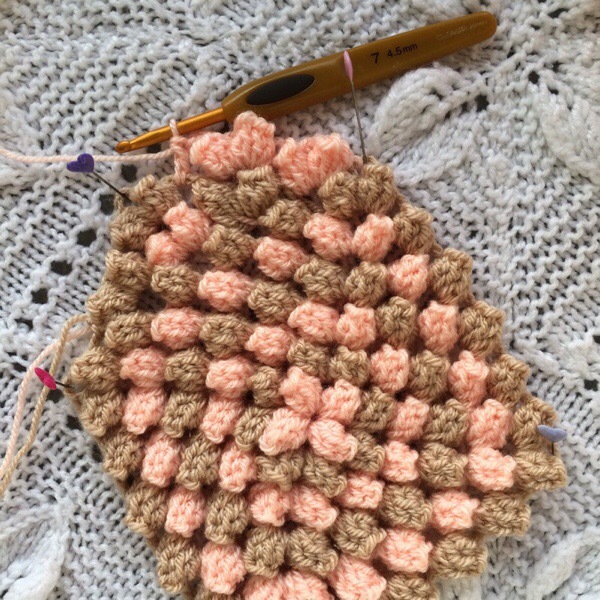 For the first popcorn of each round you will need to replace the first treble crochet with a chain of 3. The first row of pictures shows the steps for making a popcorn with a ch3 and 4tr. The second row of pictures shows a popcorn made from 5tr. Drop the loop from the hook. Insert the hook into the 3rd chain of the beginning ch3 and then pick up the working loop again. Draw the working loop back through the first stitch. Foundation ring: Chain 4. Sl st in first chain to close and make a ring. Round 1: On this first round you will be working into the ring. Make a PC (remembering to replace the first of the 5 trebles with a chain 3, which counts as a treble) and then ch3. *PC, chain 3*. Repeat from *-* two more times and then sl st into the back of the first PC to close the round. Slip stitch into the next ch sp so that you’re starting the next round in the right place. Round 2: On this round you are working into the chain spaces between the popcorns of the previous round. In the first ch sp make [PC, ch3, PC] – this makes your first corner. *Ch3, then [PC, ch3, PC] in the next ch sp*. Repeat from *-* two more times. Sl st into the back of the first PC to close the round, and then sl st into the next ch sp to begin round 3. Round 3: Popcorns are worked into the chain spaces between the popcorns of the previous round. In the first ch sp make [PC, ch3, PC] to make your first corner. *Ch3, PC in the next ch sp, ch3, [PC, ch3, PC] in the next corner ch sp of the previous round*. Repeat from *-* two more times. Ch3 then sl st into the the back of the first PC to close the round. Sl st into the next ch sp to begin round 4. Round 4: Popcorns are worked into the chain spaces between the popcorns of the previous round. In the first ch sp make [PC, ch3, PC] to make your first corner. *Ch3, PC in the next ch sp, ch3, PC in the next ch sp, ch3, [PC, ch3, PC] in the next corner sp of the previous round*. Repeat from *-* two more times. Ch3, PC in the next ch sp, Ch3, PC in the next ch sp, Ch3 then sl st into the back of the first PC to close the round. Sl st into the next ch sp to begin round 5. Round 5: Popcorns are worked into the chain spaces between the popcorns of the previous round. In the first ch sp make [PC, ch3, PC]. *Ch3, PC in the next ch sp, ch3, PC in the next ch sp, ch3, PC in the next ch sp, ch3, [PC, ch3, PC] in the next corner sp of the previous round*. Repeat from *-* two more times. Then, Ch3, PC in the next ch sp, ch3, PC in the next ch sp, ch3, PC in the next ch sp, ch3. Then, sl stitch into the back of the first PC to close the round. Sl st into the next ch sp to begin round . We now need to create two curved edges to the square to make the heart shape. We will make 1 curved edge at a time, working from right to left. Each side of the square has 7 chain spaces, including the corner spaces. Now, I’m not sure if we’re working in rounds or rows here, but i’m going to call them rows just so we don’t get confused with the rounds of the square we’ve just made. I hope that’s ok. Note: from now on, when we make the first PC in each row it is no longer necessary to replace the first treble crochet with a ch3 – just go right ahead with 5 treble crochet for each PC. You will be fastening off your yarn at the end of each row. Row 1: Choose the side that you are going to work on and then join your yarn with a sl st into the 3rd ch sp on that side and chain 1. Then [PC, ch3, PC] in the next ch sp. Ch1 and sl st into the next ch sp. Fasten off yarn. Row 2: Join your yarn with a sl st into the 2nd ch sp of the square. [PC, ch3, PC] in the next ch sp. Ch3, [PC, ch3, PC] in the ch sp between the two PC’s that you made in the previous row. Ch3, [PC, ch3, PC] in the next ch sp. Ch 1 and sl st into the next ch sp. Fasten off yarn. Row 3: Join your yarn with a sl st into the 1st ch sp of the square (this should be a corner space). [PC, ch3, PC] in the next ch sp. Ch3, [PC, ch3, PC] into the ch sp between the first two PC of the previous row. Ch3, PC into the ch sp between the 2nd and 3rd PC’s of the previous row. Ch3, [PC, ch3, PC] into the next ch sp. Ch3, PC into the next ch sp. Ch3, [PC, ch3, PC] into the next ch sp. Ch3, [PC, ch3, PC] into the next ch sp, which should be in the last round of the square. Then ch1 and sl st into the next ch sp, which should be the corner of the square. Fasten off. You should have 12 Popcorns in this row. Your heart should be looking something like this. and then weave in all your ends. Border Round: Next you’re going to add a border to your heart. 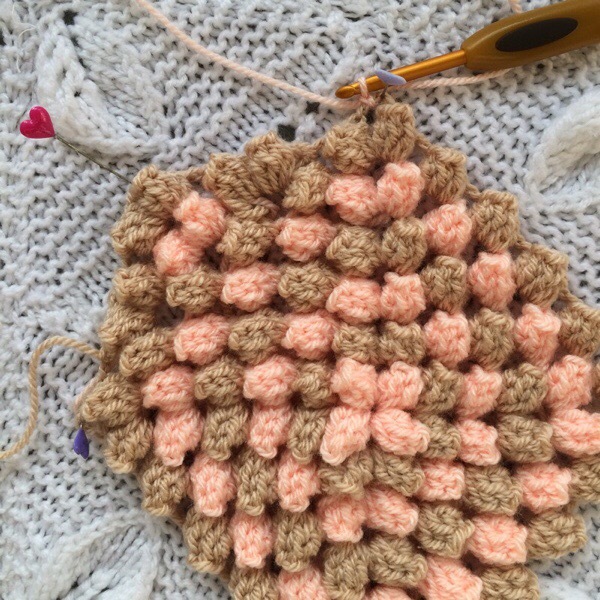 Starting in the centre of your heart – (the dippy bit, which is the first corner space of your original square) – join your yarn with a slip stitch and then make 1dc. Chain 1 and then make 3htr in the next ch sp. Continue to make 3htr in each chain space all the way around to the 3rd corner space of the original square (which will be the pointy bit of your heart). In this chain space make 2htr, 1tr, 2htr. Continue to make 3htr in all of the remaining chain spaces. 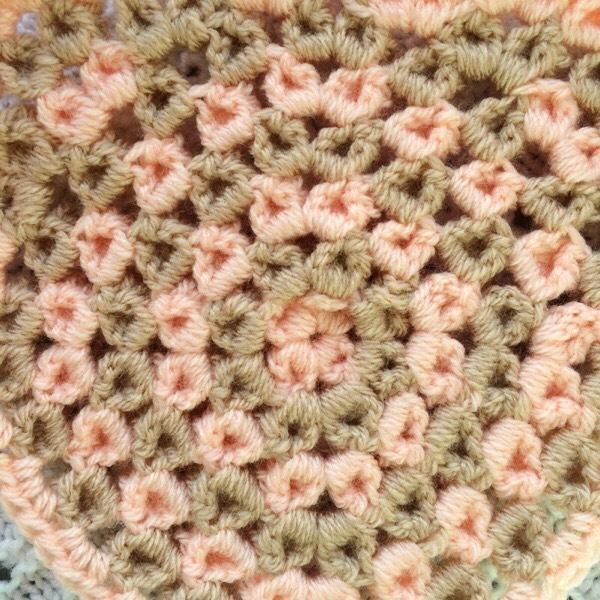 After the final space, ch1 and then sl st into the double crochet that you made at the beginning of the border round. 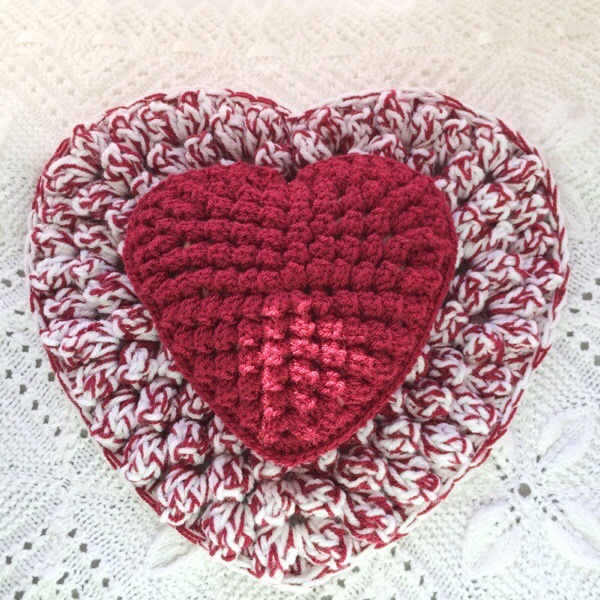 I made this cute little cushion by making two hearts in exactly the same way and then making a cushion insert. I made the insert using some scraps of fabric that I had left over from the quilt that I made in the summer. 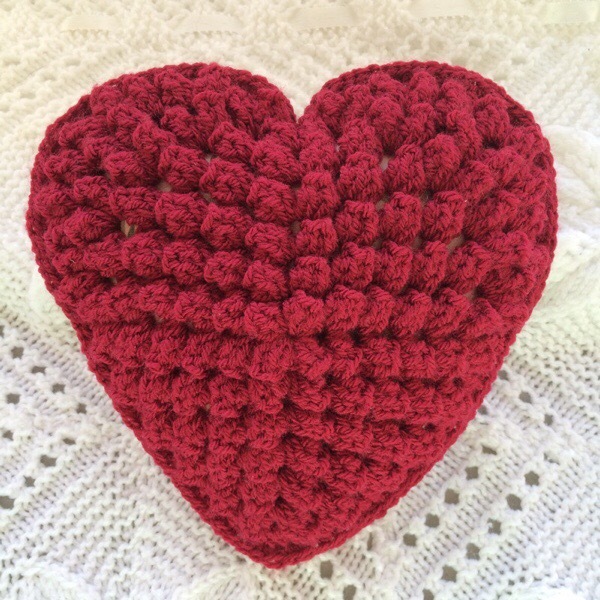 I used a t-shirt graffiti pen to draw around the crochet heart on the fabric. As it was going inside the cushion I wasn’t worried about nice seams so I stitched it together, (wrong sides together), leaving a gap for stuffing and then closing that gap on the sewing machine. I then trimmed the edges with pinking shears. 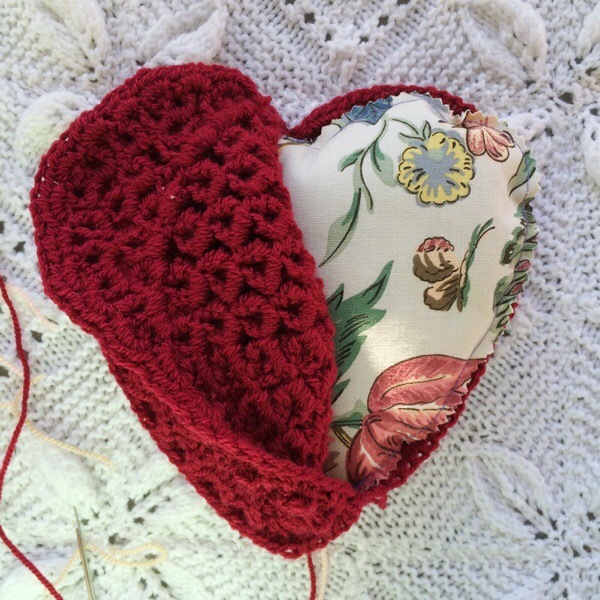 I joined the two hearts – wrong sides together – using double crochet all the way around. 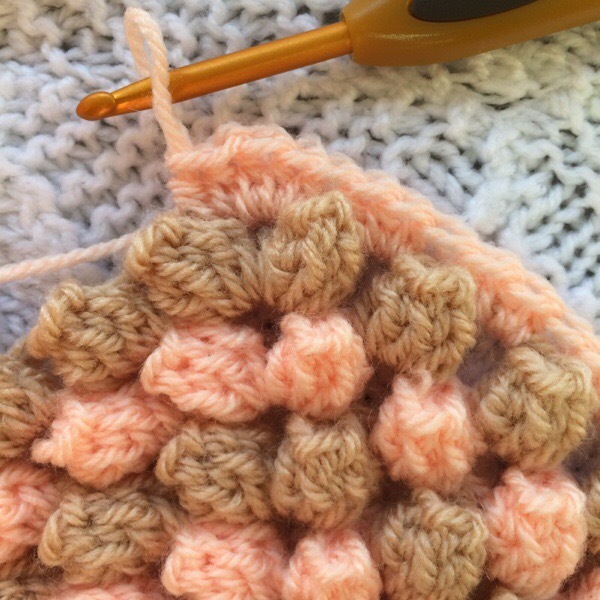 Remember to leave a gap to pop your cushion insert in and then continue your double crochet seam. 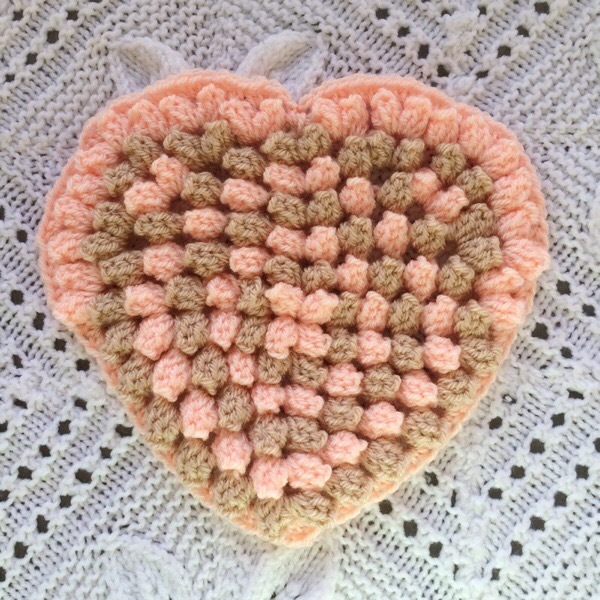 I’m not really sure why anyone would need a dinky popcorn stitch heart but it looks cute and it was fun to make! 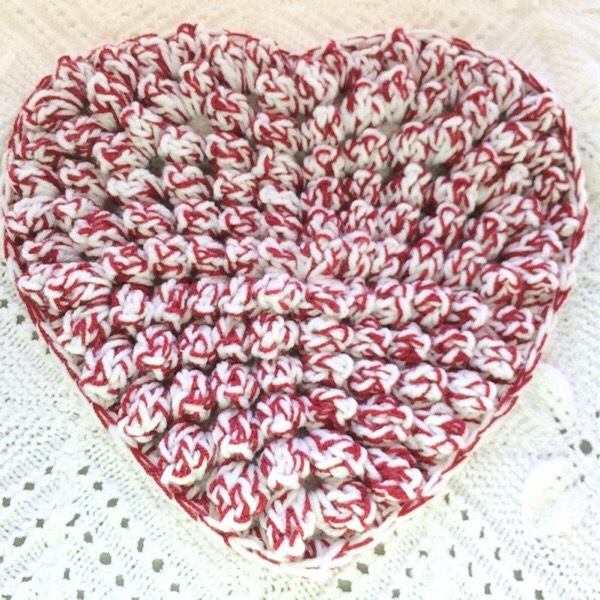 this is made with a white chunky yarn and a red DK yarn held together and stitched with an 8mm hook. I’ll probably make a fabric cushion back for this. 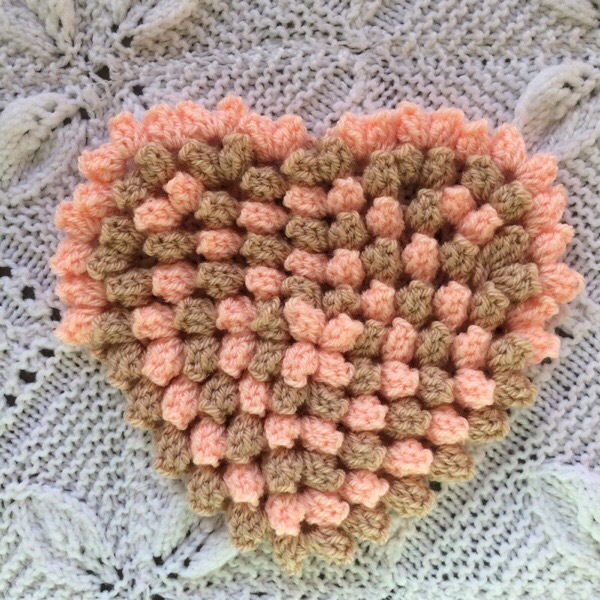 I really like the look of this and now I have visions of a chunky popcorn heart rug! It’s been a while since I’ve made a tutorial so please let me know if it doesn’t make sense or if you think I’ve missed something. And do let me know if you make a heart – I’d love to see pictures. 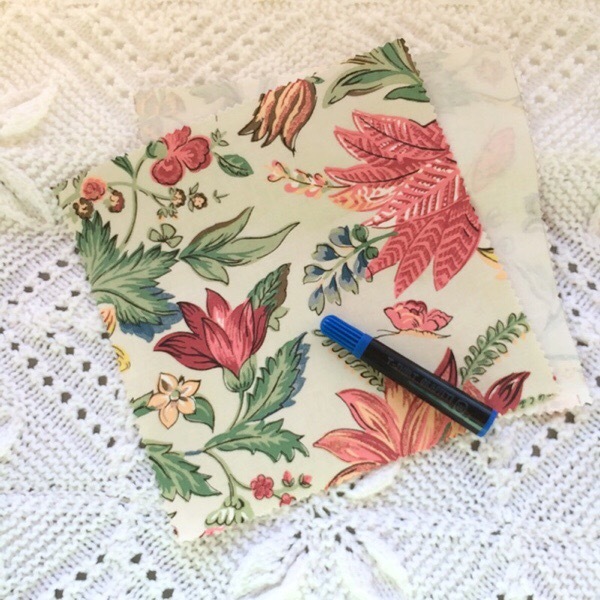 Hmmm, maybe you could use #patternpiperpopcornheart if you share pictures on Instagram, Twitter or Facebook – thinking out loud there…. 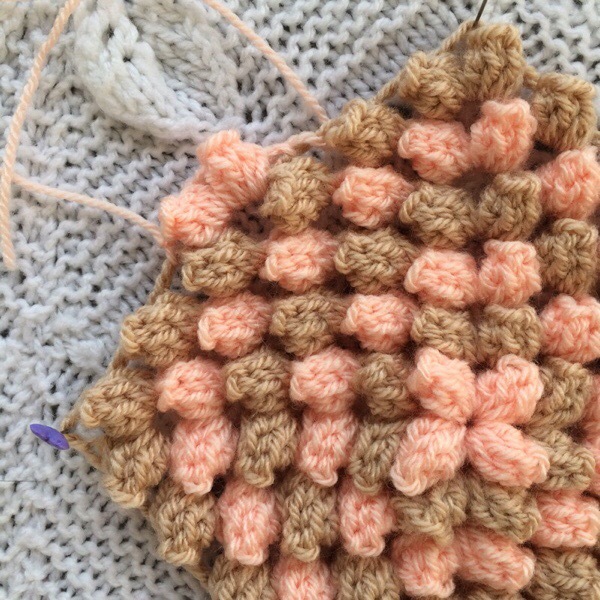 Oh, one last thing….one of my favourite things about popcorn stitch is the back – love it! These look great, I’ll definitely give popcorn stitch a try!